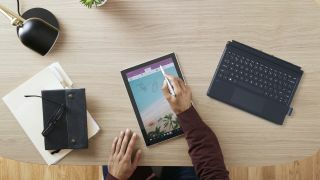 While these devices have plenty of potential, the Windows 10 on ARM devices we’ve seen so far have been let down in one key area: processing power. This has left laptops such as the HP Envy x2 struggling to perform tasks that standard laptops have no problems with. This could all change with the Snapdragon 8180, which rumors suggest will be able to provide a much-improved computing experience. Qualcomm is holding its annual Technology Summit in Hawaii in December, and many people think this will be when we’ll see an official unveiling of the Qualcomm Snapdragon 8180 (which could also be referred to as the SDM1000). According to rumors, it will be an eight-core processor with 15-watt TDP and support for LPDDR4X RAM. Four Kyro Gold cores will apparently reach 3.0GHz, while four Kyro Silver cores will clock to 1.8GHz, with the chip switching between the cores depending on the tasks. It’s also rumored to use a Qualcomm Adreno 680 GPU and have 8.5 billion transistors. Along with the faster RAM (which comes with a 2133MHz clock speed, compared to the frequency of around 1866MHz in Snapdragon 850 or 845), this could offer a very impressive leap in performance for Windows 10 on ARM devices. If the Snapdragon 8180, which has already apparently had its Geekbench benchmarks leaked, is indeed unveiled in December, we’ll hopefully start seeing Windows 10 on ARM laptops based on the hardware not long after. Should I wait for Black Friday to upgrade my PC?